STEPANAKERT—Spokesperson for the Nagorno-Karabakh Foreign Ministry Ani Sargsyan spoke Armenian News (News.am) on Tuesday about the accusations and verdict against Artsakh citizen Arsen Baghdasaryan, who has been condemned to 15 years imprisonment in Azerbaijan. Azerbaijan claims that Arsen Baghdasaryan was a serviceman of the Artsakh Defense Army and had crossed over to the Azerbaijani side of the border on orders. At the time of his detention, Arsen Baghdasaryan was dismissed from service for an unauthorized abandonment of a military unit and was in civilian clothing. Sargsyan says the Azerbaijani side confirmed that Baghdasaryan had no weapons on his person. 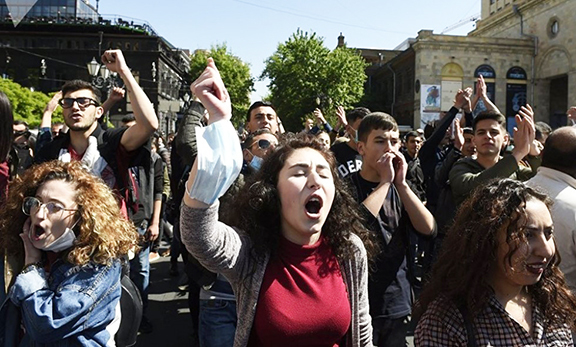 “The accusations of the Azerbaijani side, the charges against Arsen Baghdasaryan, are not only groundless, but contrary to common logic,” she said. “Even if you take into consideration the version of the Azerbaijani side that Arsen Baghdasaryan was in service, the actions of the Azerbaijani authorities are contrary to international humanitarian law, which prohibits the trial of combatants for their participation in hostilities, if they did not commit war crimes,” Sargsyan said. Azerbaijan has an abysmal track record regarding prisoners of war. Captured soldiers and sometimes regular Armenian citizens are subjected to public humiliation and sometimes torture. The prisoners often die within a few months of detention in Azerbaijan.